Arguments associated with the promotion of audit committees in many countries are premised on their potential for alleviating weaknesses in corporate governance. This paper provides a synthesis and evaluation of empirical research on the governance effects associated with audit committees. Given recent policy recommendations in several countries aimed at strengthening these committees, it is important to establish what research evidence demonstrates about their existing governance contribution. A framework for analyzing the impact of audit committees is described, identifying potential perceived effects which may have led to their adoption and documented effects on aspects of the audit function, on financial reporting quality and on corporate performance. It is argued that there is only limited and mixed evidence of effects to support claims and perceptions about the value of audit committees for these elements of governance. It is also shown that most of the existing research has focused on factors associated with audit committee existence, characteristics and measures of activity and there is very little evidence on the processes associated with the operation of audit committees and the manner in which they influence organizational behaviour. 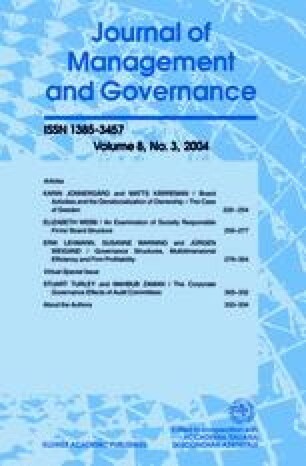 It is clear that there is no automatic relationship between the adoption of audit committee structures or characteristics and the achievement of particular governance effects, and caution may be needed over expectations that greater codification around factors such as audit committee members' independence and expertise as the means of “correcting” past weaknesses in the arrangements for audit committees. The most fundamental question concerning what difference audit committees make in practice continues to be an important area for research development. For future research we suggest (i) greater consideration of the organizational and institutional contexts in which audit committees operate; (ii) explicit theorization of the processes associated with audit committee operation; (iii) complementing extant research methods with field studies; and (iv) investigation of unintended (behavioural) as well as expected consequences of audit committees.